This was no ordinary AGM. Apart from anything else Triodos staged it with a wedding theme. Charles Middleton the MD made his vows, talked to ‘the congregation’ and encouraged them to ‘speak now’ but ‘not hold your peace’. Apart from a few wry observations that the Triodos representatives were all male and were more formally attired than the guests, declarations from the Triodos team were well received. Ethical banking is a growth industry. And gender balance was not an issue in the afternoon session, where we had a female chair and two women speakers, including me. I opposed the motion put forward by Andrew Simms from the New Economics Foundation that ‘green consumerism was merely mood music for the middle classes’. 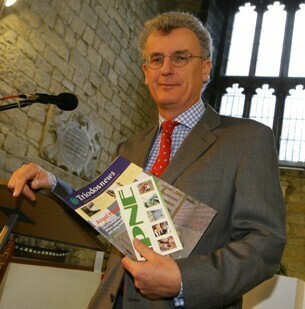 Andrew is the author of Tescopoly – he not only knew his subject but was an impassioned and entertaining speaker. But, it turned out that we were largely in agreement – to my surprise, even about cut flowers. I’d be quite happy if the cut flower industry went out of business. Whether they’re grown in Guatemala, Kenya or Kent this industry has a significant carbon footprint. It may surprise you to hear that British grown flowers, grown in greenhouses, can use significantly more energy than flowers air-freighted from the other side of the planet. So what about the people in developing countries who make a living from this blooming industry? My view is that we (by that I mean retailers) have to help them find alternative crops to grow that perhaps can be more beneficial to them and their economies. One thing I learnt was that Triodos customers are well informed. Questions from the floor weren’t trivial. We talked about peak oil, quality of life, comparative standards of living, the role of government, green taxes and lots more. I was also pleased to find that it was far easier selling The New Green Consumer Guide to this audience than to people at the Bath & West – OK, that’s not a big surprise, but it was very nice. This entry was posted in BLOG, Done, Energy & Climate, Finance & Investment, News 2007 and tagged Climate change, Financial, Green consumer.